The little-used High Divide trail that runs through the area may be hard to follow in the large meadows of Bristow Prairie, but it is easy enough to wander around without getting lost, and many of the interesting areas aren’t very far from the road that passes by the largest meadow area. The northern trailhead is hard to find because the sign keeps being taken down, but you can find it if you park along Road 5850 just south of a pillar rock next to a quarry. It goes through old-growth forest, past a beautiful pillar rock, through a meadow, and then to a floriferous, south-facing, gravelly slope before reaching Bristow Prairie itself. The southern trailhead is at the dead end of Road 5851 that passes Bradley Lake—over 16 miles of gravel, so it is easiest to approach from Rd 5850. If you don’t want to walk the old trail, bring an aerial photo and GPS to help get around and park near the main meadow along the road. 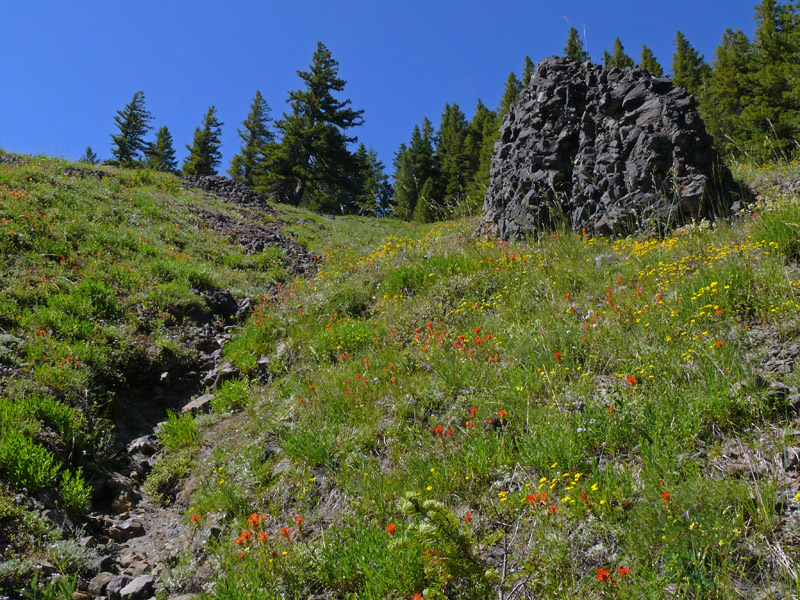 Then head straight up through the meadows and you should cross the trail as it follows the north-south ridge. Occasional cairns mark the way through the open meadows. Head south to get to more dry and rocky meadows on the Douglas County side. There’s a lovely shallow lake and wetland that is just a short bushwhack downhill to the west at the edge of the main meadow. To get to the south-facing gravelly slope on the Lane County side from the prairie, head north through a short section of woods. The trail crosses the base of this beautiful spot before continuing downhill through yet more meadows (not following the ridge as the maps show!) and to the barely marked north trailhead. Take Highway 58 2 miles east of Oakridge, then turn right onto Kitson Springs County Road. After 0.5 mile, turn right onto Rd 21. Follow Rd 21 for almost 21 miles around the reservoir (just about 0.7 mile past Campers Flat Campground). Turn right and cross the bridge over the Middle Fork of the Willamette. Take the right hand road, Coal Creek Road 2133. To north trailhead and main meadow: After 1.25 miles, take a right onto Road 200. After 4.2 miles, you will drive by the base of “Mosaic Rock”. By now the road has changed to Indian Creek Rd 2125 on the maps. Continue another 2.2 miles until you hit Rd 5850. Turn left and drive for just under a mile. Park somewhere past the large pillar rock on your right—there is no real pulloff. If you continue south on Rd 5850, you’ll reach the edge of the main meadow in another mile. A large parking area can be found another 0.6 mile or you can park along the road. To south trailhead: Continue for 14.1 miles on Coal Creek Road 2133 until you reach a 4-way intersection on top of the Calapooya divide. The road becomes Rd 5851 part way up. Continue to the right on Rd 5851 for 2.7 miles until the road deadends near the trailhead.